Emerin is a member of the nuclear lamina associated protein family. It is ubiquitously expressed and localized to the nuclear membrane in normal cells. Mutations of the gene that encodes emerin result in the X-linked recessive disease Emery-Dreifuss muscular dystrophy (EDMD), which is characterized by slowly progressing contractures, skeletal muscle wasting and cardiomyopathy. Reportedly, lack of Emerin expression is one cause of EDMD. Emerin is involved in the association of the nuclear membrane with the lamina, and is localized specifically to desmosomes and fasciae adherents in the heart. Identification of nuclear membrane irregularities with anti-emerin antibody has been reported useful in diagnosing papillary thyroid carcinoma. Small volumes of anti-EMD antibody vial(s) may occasionally become entrapped in the seal of the product vial during shipment and storage. If necessary, briefly centrifuge the vial on a tabletop centrifuge to dislodge any liquid in the container`s cap. Certain products may require to ship with dry ice and additional dry ice fee may apply. 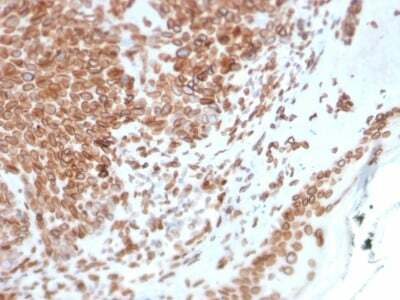 Formalin-fixed, paraffin-embedded human Breast Carcinoma stained with Emerin Mouse Monoclonal Antibody (EMD/2168). Formalin-fixed, paraffin-embedded human Basal Cell Carcinoma stained with Emerin Mouse Monoclonal Antibody (EMD/2168). 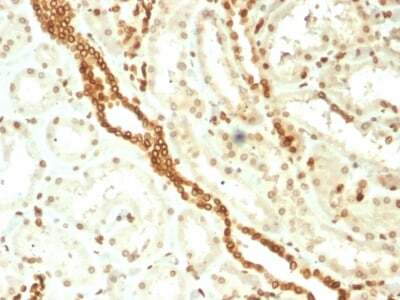 Formalin-fixed, paraffin-embedded human Renal Cell Carcinoma stained with Emerin Mouse Monoclonal Antibody (EMD/2168). Western Blot Analysis of human HeLa Cell lysate using Emerin Mouse Monoclonal Antibody (EMD/2168). 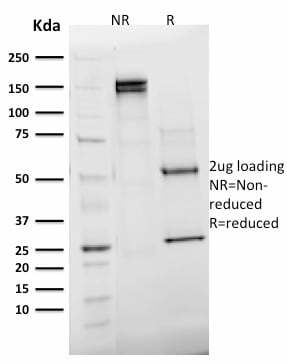 Analysis of Protein Array containing more than 19, 000 full-length human proteins using Mouse Emerin Monoclonal Antibody (EMD/2168) Z- and S- Score: The Z-score represents the strength of a signal that a monoclonal antibody (MAb) (in combination with a fluorescently-tagged anti-IgG secondary antibody) produces when binding to a particular protein on the HuProtTM array. Z-scores are described in units of standard deviations (SD's) above the mean value of all signals generated on that array. If targets on HuProtTM are arranged in descending order of the Z-score, the S-score is the difference (also in units of SD's) between the Z-score. S-score therefore represents the relative target specificity of a MAb to its intended target. A MAb is considered to specific to its intended target, if the MAb has an S-score of at least 2.5. For example, if a MAb binds to protein X with a Z-score of 43 and to protein Y with a Z-score of 14, then the S-score for the binding of that MAb to protein X is equal to 29. NCBI/Uniprot data below describe general gene information for EMD. It may not necessarily be applicable to this product. Bione, S., Maestrini, E., Rivella, S., Mancini, M., Regis, S., Romeo, G. and Toniolo, D. 1994. Identification of a novel X-linked gene responsible for Emery-Dreifuss muscular dystrophy. Nat. Genet. 8: 323-327. 1. Epstein-Barr virus early lytic protein BFRF1 alters emerin distribution and post-translational modifications.